Home › Technical Analysis › Trading opinion › Did Dow Get It Right Again? Did Dow Get It Right Again? Charles Dow in an editorial Jan 24, 1902 discussed short selling. The observation was made that about half of every decade investors should focus on the short side of the market. Traders of the day made a point of distinguishing between bull and bear markets as shown by a study of the averages. Interestingly Alan Kohler in the weekend edition of the Eureka Report to which I subscribe, observed that last Thursday marked the fifth anniversary of the credit crisis, if you take August 9, 2007 the day that BNP Paribas froze redemptions in three funds dealing in US sub-prime mortgage assets, as the date for the start of the global financial crisis. 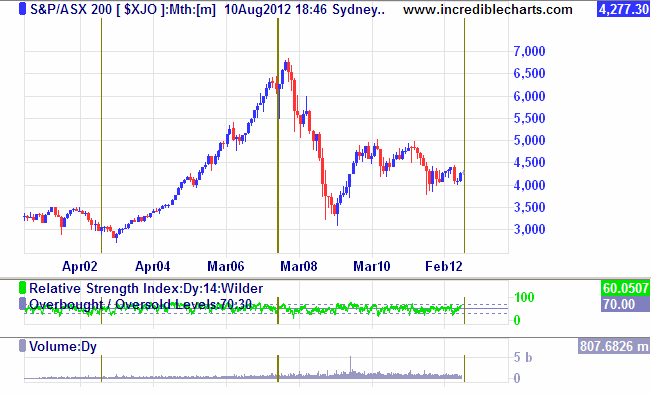 Equally interesting is the five year bull market Australian investors enjoyed prior to this. The first vertical line on the above monthly chart passes through the October 2002 month candle, and roughly corresponds to the start of the bull market. It was in this month that congress approved the use of military force against Iraq. This decision may have been something of a disaster both militarily, and from the point of view of US debt, but it stimulated global economies as shown in stock market indices. Hopefully Dow will be right again and we will see a transition to a more bullish market soon.